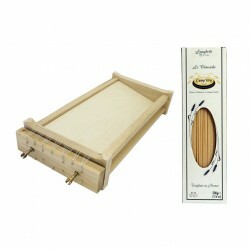 Give your loved ones a taste of Italy! Cookery courses at the Italian School of Cooking, eating at Pinocchio Restaurant, Italian food and wine products, travel in Italy. Choose below your favourite. Gift Vouchers There are 10 products. ANY CLASS - Voucher validity: 1 year VIEW OUR COOKERY CLASSES Where: Italian School of Cooking - 1 Pudding Row, Essex Street West, Temple Bar, Dublin 2 Please note: the price is inclusive of the paypal fee. TO AVOID THE PAYPAL FEE, you can purchase the voucher directly over the phone by credit card at (01) 460 8800, Mon-Fry between 9.00-17.00 GMT. Any 2 classes - Voucher validity: 1 year VIEW OUR COOKERY CLASSES Where: Italian School of Cooking - 1 Pudding Row, Essex Street West, Temple Bar, Dublin 2 Please note: the price is inclusive of the paypal fee. TO AVOID THE PAYPAL FEE, you can purchase the voucher directly over the phone by credit card at (01) 460 8800, Mon-Fry between 9.00-17.00 GMT. 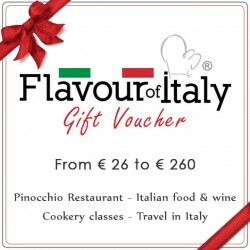 FLAVOUR OF ITALY GROUP LTD GIFT VOUCHERS. Valid on our services & products. Voucher Validity: 1 year. VALUE from € 26.50 to € 262.50. Please note: the price is inclusive of the paypal fee. TO AVOID THE PAYPAL FEE, you can purchase the voucher directly over the phone by credit card at (01) 460 8800, Mon-Fry between 9.00-17.00 GMT.